My third opening night on Hennepin Avenue (aka the Broadway of Minneapolis) in just over a week was for the touring production of the recent Broadway revival of Evita. 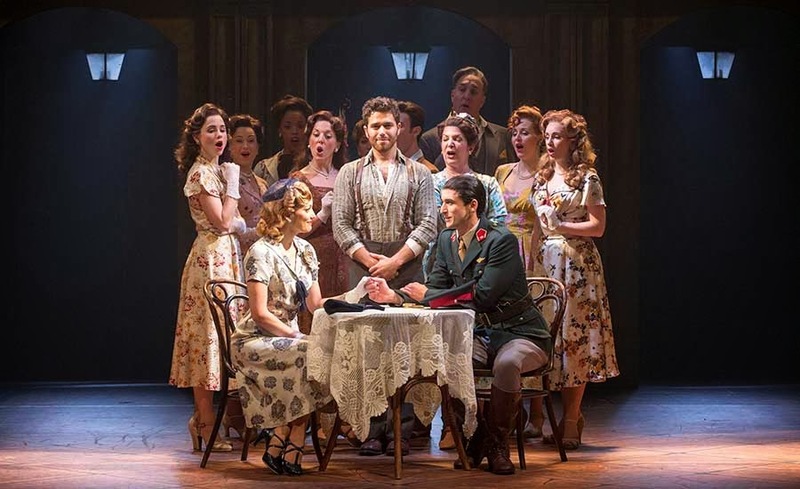 Written by Andrew Lloyd Webber and Tim Rice, this musical about the first lady of Argentina Eva Perón won seven Tony Awards in 1980. It's a compelling story about a woman from a poor family who rose to become one of the most powerful and beloved women in Argentina, with a beautiful and recognizable score ("Don't Cry for Me Argentina," "You Must Love Me"), and this is a lavish production with a great cast. I saw a nearly perfect production by Theater Latte Da a few years ago so I wasn't sure I wanted or needed to see it again. But I love the score (I have the soundtrack from the 1996 movie starring Madonna), so I enjoyed seeing it brought to life by a large and talented cast and orchestra. In the entirely sung-through musical, Eva's story is told by a narrator known as Che. We follow Eva as she escapes a life of poverty in a small village to run away to Buenos Aires with a musician. There she makes a career as a singer and actress, and eventually meets the politician Juan Perón. She hitches her wagon to his star, and after he becomes president, together they become a powerful force and the celebrity couple of the day. Her legacy is somewhat complicated, as politics mixed with charity and wealth. After Eva went on a PR tour through Europe, dubbed "The Rainbow Tour," she fell ill and died at the age of 33, with a lavish and well-attended funeral. The musical brings us full circle, beginning with a scene from her funeral, and then flashing back to tell her life story, ending at the funeral again. Throughout the highs and lows, Che is there to offer commentary on the issues that her story brings up - fame, politics, celebrity worship, class. 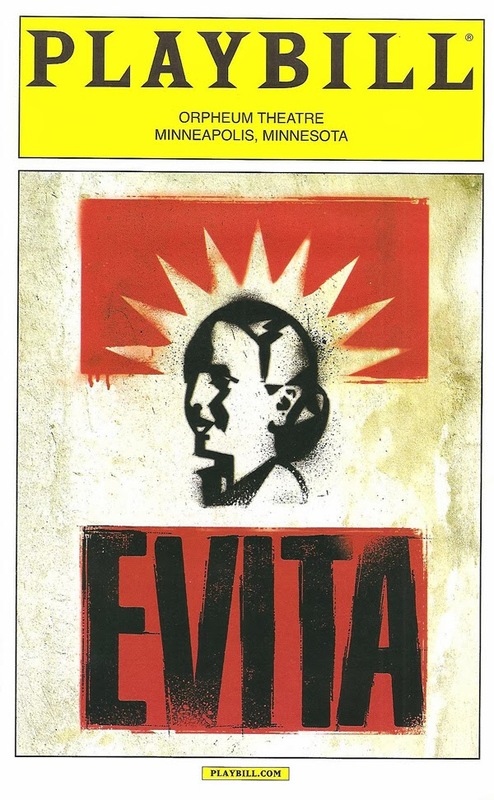 The show may be called Evita, but the star of this show is Josh Young as Che. He gives a completely engaging performance and displays incredible vocal range, from a lovely falsetto to a rich warm tone in the lower register, plus a rocker wail when called for. Che is onstage for almost the entire show, observing and commenting on Eva's life, and confronting her in one captivating waltz. I found myself constantly seeking him out to watch his reactions, and when he wasn't on stage, his absence could be felt. Caroline Bowman is a strong Eva, making a convincing transformation from an ambitious young girl to a well-respected woman with failing health. As Juan, Sean MacLaughlin is smooth and polished. The large ensemble is fantastic; Krystina Alabado is a standout with a beautiful performance of the poignant "Another Suitcase in Another Hall." The sets and costumes in this Broadway tour are of course impressive, with lovely period costumes and a relatively simple set with one impressive piece - the balcony. The show also features nice use of what I'm assuming is actual video of the time. If you can only see one of the three musicals currently playing on Hennepin stages, it should be Theater Latte Da's Cabaret at the Pantages Theatre - a stunning display of local talent. After Cabaret, the choice between Minneapolis Musical Theatre's Five Course Love at New Century and the touring production of Evita at the Orpheum depends on what you're looking for - a light and fun show in an intimate space with a small local cast (Five Course Love) or a lavish Broadway production (Evita, playing through this weekend only).